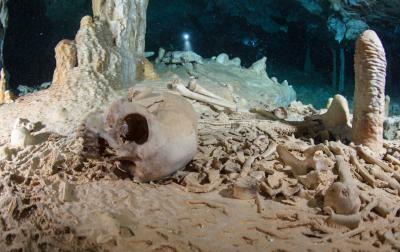 Analysis of a skeleton found in the Chan Hol cave near Tulum, Mexico suggests human settlement in the Americas occurred in the late Pleistocene era, according to a study published August 30, 2017 in the open-access journal PLOS ONE by Wolfgang Stinnesbeck from Universität Heidelberg, Germany, and colleagues. Scientists have long debated about when humans first settled in the Americas. While osteological evidence of early settlers is fragmentary, researchers have previously discovered and dated well-preserved prehistoric human skeletons in caves in Tulum in Southern Mexico. To learn more about America's early settlers, Stinnesbeck and colleagues examined human skeletal remains found in the Chan Hol cave near Tulum. The researchers dated the skeleton by analyzing the Uranium, Carbon and Oxygen isotopes found in its bones and in the stalagmite which had grown through its pelvic bone. The researchers' isotopic analysis dated the skeleton to ~13 k BP, or approximately 13,000 years before present. This finding suggests that the Chan Hol cave was accessed during the late Pleistocene, providing one of oldest examples of a human settler in the Americas. While the researchers acknowledge that changes in climate over time may have influenced the dating of the skeleton, future research could potentially disentangle how climate impacted the Chan Hol archaeological record. Funding: All the funding or sources of support received during this specific study have been presented. This financial support was granted to us by the Internationales Büro of the German Bundesministerium für Bildung und Forschung (BMBF project 01DN119) and the Deutsche Forschungsgemeinschaft (DFG project STI 128/28-1). MD acknowledges support by the Irish Research Council (IRC) by a Government of Ireland Postdoctoral Fellowship (GOIPD/2015/789). BMBF and DFG financed our field work in Mexico and provided funds for laboratory work. Author Michael Deininger received a salary from the IRC during part of this study. Other than that the funders had no role in study design, data collection and analysis, decision to publish, or preparation of the manuscript.